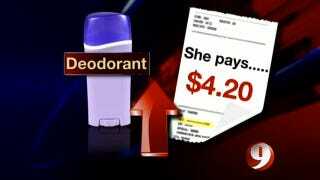 Click to viewAt first the reporter finds a minor price discrepancy between shaving creams for men and women. A 7 ounce Skintimate Sensitive Skin shaving cream cost $2.49, while an 11 ounce Gillette Foamy Sensitive Skin is $1.99. The ingredients are similar, but Skintimate gives the BS explanation that their products are targeted for more skin care needs. Next the report compares Right Guard Total Defense, which is $4.29 for 4 ounces, and Secret Clinical Strength Sport, which is $8.49 for 1.6 ounces. Some producer must have been excited to find such a ridiculously expensive deodorant, but as the company points out, these are actually different products. "Clinical strength" deodorants have a higher concentration of the active ingredient. Procter & Gamble, which manufactures Secret deodorant, makes an equivalent men's product: Gillette Clinical Strength Advanced. Online prices for the men's "clinical strength" deodorant range from $5.25 to $9.99. The story also mentions a study done in the '80s that found women are usually charged twice as much as men to dry clean similar shirts. Recently, employees at a local dry cleaner said it costs $4.99 to clean a woman's blouse, but only $1.65 to clean a men's shirt because women's shirts don't fit on the standard shirt press and must be done by hand. That's a reasonable explanation for the cost discrepancy, but the fact remains that dry cleaning is generally more expensive for women. It's unclear from this report if retailers drive up prices due to sexism, or simply because women go through more elaborate beauty rituals, but for whatever reason, being a woman means forking over more money for daily upkeep.